Robert Hood is a highly respected, award-winning author, considered by many to be one of Australia’s grand masters of horror and weird fiction. Though over his 40-year career (to date) he has published speculative fiction of all kinds, he has notably produced 43 short stories that feature ghosts, hauntings and spectral horrors. These memorable tales display his ability to make the fantastic real, to embrace weirdness, and create human characters whose inner and outer lives, haunted by mortality, are laid bare and revealed to be our own worst nightmares. Ranging from melancholy reflections on life and death, through disquieting tales of dark humour and vengeance, to chilling visions of ghostly apocalypse, Hood’s stories are sure to draw you into a terrifying world that in the end is revealed to be irrefutably our own. 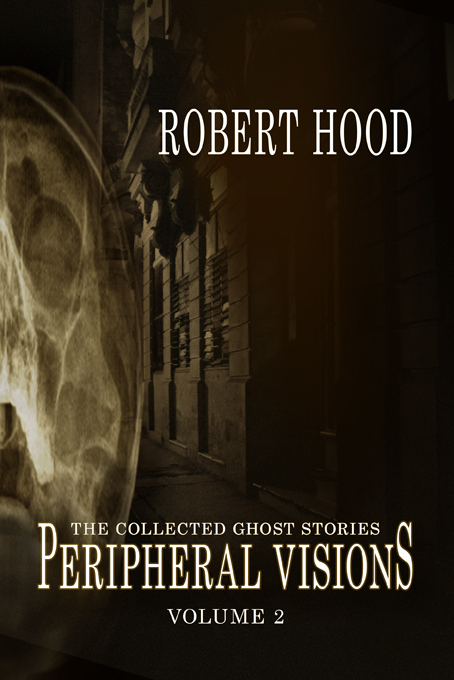 Peripheral Visions is a one-of-a-kind reference collection that includes all of Hood’s 43 ghost stories to date, three of them especially written for this volume. Peripheral Visions is a large volume of work, with a word count over 220k. In trade paperback format it will be published in two volumes, spaced over a month. Here is the appearance of the two covers, when laid side-by-side. A single volume hardcover edition will also be published, with internal illustrations by Nick Stathopoulos. The exciting part of this publishing effort is a signed, limited hardcover edition, which can be pre-ordered now. There are only 200 limited edition copies available (numbered), each of which includes a Nick Stathopoulos-designed signature page, and a bonus ‘chap-ebook’ containing several zombie stories, titled Haunted Flesh: Stories of the Living Dead. These editions will disappear quickly, so we recommend interested readers pre-order now. In order to reflect the diversity of Hood’s approach to creating effective ghost fiction, the stories have been sorted under various thematic headings. These include stories of Haunted Places, such as houses, ancient landscapes, political residences, hotels, cities, and even cars. Haunted Families puts the emphasis on family members: mothers, fathers, sons and daughters, and even asexual post-humans. Haunted Minds is a group of particularly subjective tales, where the ambiguity of events reveals hauntings seemingly emanating from within the minds of the characters. One of them even includes a giant monster. Haunted Youth collects a number of stories originally written for young people, though their humour, quirkiness and simple truths can be readily enjoyed by older readers. Haunted Vengeance brings together stories of people haunted by the scars left behind by the violence and selfishness of the past, both their own and that of others. In Haunted Realities you will find a strange group of stories that go to weird places both real and imaginary, including Spandau prison, the past and future of Frankenstein’s monster, an industrial colony on the moon, a city of monsters and ghosts, and finally times of apocalypse and the End of Humanity. These are not necessarily traditional ghost stories, though many of them draw on the traditions of the past. As you read, remember this: not everything is as it seems. This entry was posted in News, Sneak Peek, Title and tagged anthology, collection, ghost stories, robert hood. Bookmark the permalink.